Q&A with Stephanie Cowell and Giveaway! Stephanie Cowell is the author of Claude & Camille a book I read last year and really enjoyed. I got the chance to ask her a few questions to share with you now in celebration of the paperback release. Read my original review. What drew you to writing this story? I loved the feeling of artistic community in the book. Have you experienced a similar community in your writing? Yes, I have experienced it absolutely and do now! In 1989 before I was published group of us formed a writing support group which grew out of a class with our mentor Madeleine L’Engle. We stayed together ten years; at first none of us were published and by the time we ended, we were almost all professionally published. We were the dearest friends, helping each other in every aspect of our lives. We still are the dearest friends, though the young women married and moved away. And now I have a wonderful online support community and a lot of us will be meeting at the Historical Novel Conference in San Diego this June. Oh my goodness, this calls for a list! Claude Monet, of course, and Renoir’s tender people and Pissarro for his landscapes, and the back some centuries I love a lot of the Renaissance artists. I love the artists who were often anonymous and who painted the illustrations back when books were made by hand. I don’t like very much 20th century art. I like Picasso before he went into cubism and not after. I am missing many artists in this list. What have been some of your greatest inspirations in writing? Every time I read another marvelous novel I am inspired. I had an odd combination of inspiring writers as a child. I adored The Secret Garden and A Little Princess and of course the Bronte sisters. I remember finishing Wuthering Heights and immediately starting it again. I read it one summer while we stayed by the sea, and always associated it with the waves. I read all of Dickens but my greatest single inspiration remains Shakespeare. I have read him all my life I love E.M. Forster and when I was twenty I just swooned over Tolstoy’s War and Peace. I found a very old collection of Jane Austen in my school library when I was 17 and read them all. The edition was at least 100 years old and no one had yet cut the pages! I am amazed at the technique and heart in the books of my colleagues. I am just amazed. What other great books have you read about artists? I think my top favorites would be Girl in Hyacinth Blue by Susan Vreeland (she wrote it when recovering from leukemia and not knowing for sure if she would live); the writing is so gorgeous. And her books about Artemisia and Renoir. And Tracy Chevalier’s Girl in a Pearl Earring, which I think was sent to her by an angel. I love Dunant’s The Birth of Venus. There is a new one coming out Leaving Van Gogh by Carole Wallace, very deep, very touching, very real. Oh and yes! There’s one other one about Monet which takes place on one single day when he is 60 and in Giverny and it’s called Light. It’s by Eva Figues. It’s very short and done from many points of view but the main character is the light over all of them. The writing is so gorgeous. Harriet Chessman’s book about Mary Cassatt’s sister (I think it’s Lydia Cassatt Reading the Morning Paper) is quiet and beautiful. There are so many I have forgotten a great deal. Bundrick’s Sunflowers is also quite beautifully done. I am well into the second draft of new novel set in Victorian London about the love story of the poets Elizabeth Barrett Browning and Robert Browning. She was an invalid of 40 and still very beautiful when he found her in her father’s house and snatched her away from her family to live in Florence with him. I am also working on a 16th century novel set in an English abbey, about the goddaughter of the abbot who grows up in the monastery working in the library with her father and falls in love in a dangerous way. And the terrible truth is I was forever getting rather far into novels and then leaving them for other novels. I hope to live to be very old to finish them all! I think I just added a ton of books to my TBR list! Thanks Stephanie! 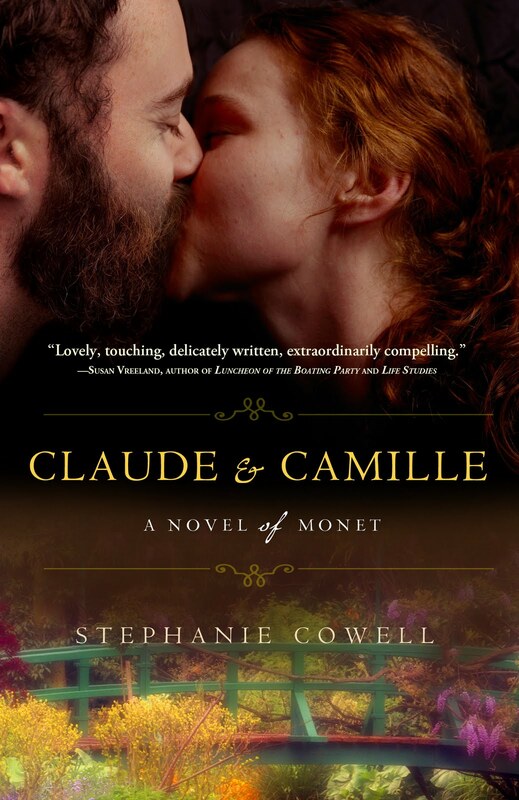 Thanks to Crown Publishing I have 5 paperback copies of Claude & Camille to give away! To enter just fill out the form below. You must have a United States mailing address. I will notify the winner by email. Giveaway closes April 15th at 11:59 PM EST.